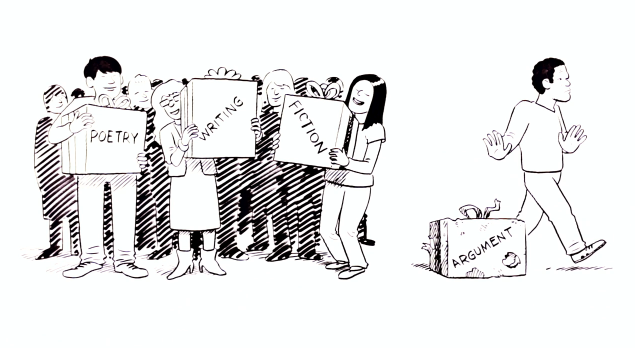 Watch my animated talk on Argument! “I teach science.” “I am a software developer.” “I manage an office for…” Almost always, people speak about what they do. Resumes consist of lists of what applicants can do. But what if focusing on what people can do isn’t the most important thing? What if what you can do is far less important than who you are? Both people can do the job, but coworkers always ask only one of them for help not the other. Why? Learn the importance of discovering and developing who we are and how changing our focus dramatically improves the workplace. A principal reads PowerPoint slides at the staff. A teacher has poorly designed white board slides. Someone from staff development buries the audience with jargon. All of us can become better communicators. Learn how to design more effective presentations, and learn how to present more effectively. Become more confident as a speaker in all situations–in front of a class, in the staff meeting, at Back to School night, at the board meeting, at the all-school assembly, and more. Everywhere you look, educators talk about reading and writing, reading and writing. They are almost one word now: readinganwriting. But to be literate today demands so much more! We must expand our definition of literacy. Students need to be “oral communication literate” in a world where speaking skills are on display in so many digital ways. Students need to be able to be “sound and image literate,” because every message has those attached. Students need to be “bias literate,” understanding their own and recognizing bias in others. Students need to be “Internet literate,” understanding how to read and analyze what they find online (including fake news). This talk explains the need for rethinking our limited ideas about literacy and shares practical ways to create students who are truly, broadly literate. Today, reading is much more than making sense of ink on paper. As students read enhanced texts and read online, they discover that reading involves embedded video, images, audio, and hyperlinks. To comprehend what they “read,” students need to be media literate, understanding the language of sound and image; they need to be Internet literate, understanding how to evaluate websites and the information contained on their pages, and they need to be digital-text literate, understanding how to stay focused in spite of the distractions online. This talk explains the skills needed by today’s readers and suggests ways to teach those skills. The standards that apply to your school probably include speaking and listening standards. This is somewhat of a misnomer. The “listening” standard is actually “Comprehension and Collaboration”—much more demanding than the word listening suggests. To truly comprehend the information presented in diverse media and formats, students need media literacy and Internet literacy. Teachers may be unprepared to teach these. This talk explains the skills needed and suggests strategies for preparing students to understand information in the digital age. Additionally, to truly collaborate, students need to master active listening, paraphrasing, and more. The talk gives teachers strategies to improve these skills. Many states have standards that increase emphasis on the most important language art: speaking. This presentation centers on the art of effective oral communication. Speaking skills are broken into manageable, teachable parts to show teachers how to enable students to speak well in a variety of settings. Participants will come away with an understanding of the elements of successful speaking. Drawing upon twenty years of success with PVLEGS© and Six Trait Speaking©, the ideas presented will change how participants think about speaking. Whether the goal is improved class discussions, improved formal speeches, or improved one on one communication, this presentation will give teachers a new framework to improve student speaking in the classroom and beyond. The standards movement has increased attention on argument. Every day, argument, persuasion, and reasoning are part of student lives, yet often the activities that call for these demonstrate that our students need some help. Though students are often involved in discussions, those discussions often devolve into opinion spouting. Persuasive writing and speaking show errors in thinking and use of evidence. Only by specifically teaching students how to construct effective arguments, to use evidence, and to add persuasive and rhetorical techniques can that be avoided. This talk explains fundamental principles of logic and how to build a conclusion from statements/premises; how to use the five types of evidence to support those statements, how to avoid common reasoning errors students; and how to move from argument to persuasion. Practical ideas and lesson are offered enabling teachers to help students develop good thinking. To our students, school means paper and pencil and word-processed assignments. Outside of school, though, our students write and produce in ways we ignore in the classroom. New tools and sites offer new opportunities to engage our students and develop core skills. Brilliant options for writing exist. Digital tools that showcase speaking exist (podcasts, webinars, video calling and video conferences, and more) yet we fail to take advantage of these possibilities. This presentation will change how teachers think about writing and speaking. The session will introduce teachers to alternative kinds of writing assignments and make teachers comfortable assigning and accepting new modes of writing–writing that is more relevant to 21st century learners. Participants will learn about sites and tools that encourage and develop oral language skills.